With a growing population and an increase in tourists, Dubai had to solve the problem of their transportation infrastructure. The Metro was constructed beginning in 2006, with the first Metro station opening in 2009. The trains, which are driverless, include first class sections, as well as women and children only sections. The windows in the Metro trains have fantastic views of the city. The Dubai Metro has two lines. The first line is the Red Line, which runs from Rashidiya to UAE Exchange or Jebel Ali and the Green Line, which runs from Etisalat to Dubai Healthcare City. There are two stations where passengers can transfer, Union station or BurJurman station. One nice thing about the Metro system also connects to the tram system. It is connected at the DAMAC Metro Station and Jumeirah Lakes Towers Metro Station which are both on the Red Line. To assist passengers with mapping out their journey, there is an interactive map available online of the metro system. 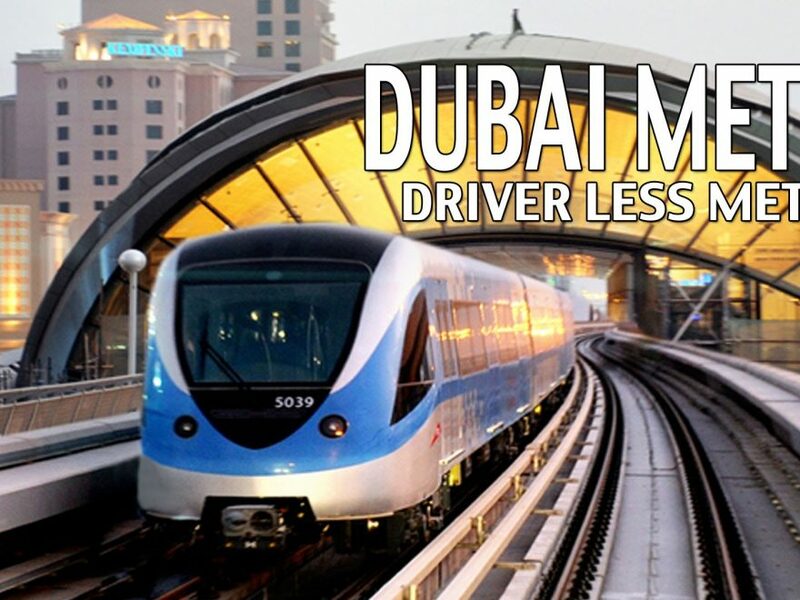 The Dubai Metro operates every day of the week and the operating times vary by the day of the week. The Red Line runs Saturday to Wednesday from 5:30am to midnight and on Thursday from 5:30am to 1am and on Friday from 10am to 1am. The Green Line runs Saturday to Wednesday from 5:30am to midnight and on Thursday from 5:50am to 1am and on Friday from 10am to 1am. If you miss a train, don’t fret, the trains arrive about every 4-5 minutes during peak times and about every 7-10 minutes during off peak hours. An entire trip on the Red Line, which would be from Rashidiya to Jebel Ali, will take about an hour and eight minutes. While an entire journey on the Green Line, which is from Etisalat to Dubai Healthcare City, will take about thirty-six minutes. The time the train doors are open is about 15 to 20 seconds, however this can be extended during peak hours of traffic and travel. The fares are relatively cheap and your ticket or card must be bought and pre-loaded before your journey. These can be purchased at Metro stations, bus stations and sales agents that have been authorized. On the metro there are five passenger cars, one of the passenger cars are divided into two cabins, Gold Class and Women and Children only. The other four passenger cars are for standard class. Be aware that fines will be imposed if you are riding in the incorrect cabin class. The Metro also offers stop at the Dubai International Airport, stopping at Terminal 1 and Terminal 3. On the metro, a passenger is only allowed to carry two pieces of luggage, one larger suitcase and one piece of carry on luggage. Overall, the Metro is very convenient and a great value for your money. It makes getting around Dubai very easy and makes travel to and from the airport also very convenient. There is also wifi and mobile phone coverage throughout the Metro track and the metro stations, including the underground parts of the Metro. There are also public toilets and washroom facilities in all the stations.